Home » Blog » CAT Prep Strategy – How to Start Preparation for CAT 2019? You know what is the best time to start CAT Preparation for CAT 2019 exam – NOW! A lot of people just keep waiting for the right time. There is no such thing as ideal time for starting CAT Preparation. CAT 2019 is around one year away. Remember the basic fact, you can get to a basic level of preparation and a decent score very quickly – getting to a great score, on the other hand, requires a lot of effort. 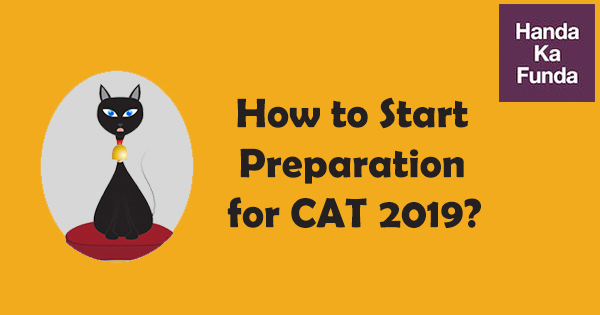 In this post I would discuss about some of the things that you can and should do to start your preparation for CAT 2019. Also, do keep in mind that you get multiple shots at getting a good CAT score but you get only one shot at getting a good graduation score. If you are in your 5th semester, you are done with only half of your engineering. You still have a lot of time to improve your graduation score. It would be wise if you focused on improving your grades at this stage than anything else. Even if you can dedicate 3-4 hours a week at this stage towards your CAT preparation and put the rest of the time towards improving your marks – it would be a wise choice. Another thing that I would want to emphasize is that there are some portions of CAT that take a lot longer to improve than the others. For example, if you are bad in Geometry – you can become decent at it with just couple of weeks of effort. On the other hand, if your ‘Verbal Ability’ is below par – it would probably take you a lot longer to improve. I would categorize ‘Logical Reasoning’ as something that would be in the middle. Please understand that I am not making these points with respect to the difficulty level but with respect to the amount of time required to go from ‘poor’ to ‘average’. It is a whole different ball game if you want to go from ‘average’ to ‘good’, but you got more than enough time for that. What should I do for starting preparation for CAT 2019? Pick up the last one if you are feeling a little bit adventurous. It is huge in size but you will be a different person, for good or for worse, by the time you finish it. While there are plenty of great books that are available in the market when it comes to CAT preparation, I think that the material that is provided by coaching institutes like IMS / TIME / CL is pretty good. You can probably get that from a senior or get it second hand via Olx or a second hand bookstore from your neighborhood. If not, then Pearson has a really good set of books as well. I really like the books that are compiled by Nishit Sinha. They cover nearly everything that is required for CAT preparation and a little bit extra as well. Here is a slightly more detailed analysis of best books for CAT preparation. While you are gearing up for CAT 2019, it is important that you have a look at previous year papers to get an idea about the pattern. To find out solutions and answers of Official Paper CAT 2018, click here. I run an online coaching course for CAT 2019 preparation and so I would obviously be biased in favor of it. Not only that, the CAT preparation course has close to 600 students right now. Do they have any advantage by starting CAT preparation early? The answer to both the above questions is NO. There is no such thing as the right time to start coaching for CAT 2019 preparation. The question that you should be asking yourself is – ‘Do I have the time to start CAT Preparation?’ I believe that whenever you can find 3-4 hours a week, you should formally start coaching. If you are looking at an online option, you can register from the button below. Click on this link to know more about our Online CAT 2019 Coaching course. On the other hand, if you are considering offline coaching – you can check this post in which I suggest the parameters that you should consider before joining a CAT coaching institute. Sir, does the University of college matters while looking at the score ? Is it important to have a job in hand If we get a decent percentile in CAT in the first attempt itself?